The first step in our process was to ligate our synthesised fragment of DaIRIP4 into the donor gateway vector DONOR221. The restriction digest experiment displayed in Fig1 was designed to cut once in a gene specific cut site, and once in the vector (if the multiple cloning site had been removed). The resultant number of bands would reveal the presence (or lack) of the insert. Fortunately, as is shown, our insert was found to be present and of the correct length following digestion. Once we had purified our recombinant donor plasmid, this was in turn ligated into the destination plasmid, pBW2G7, which carries a BASTA resistant cassette. 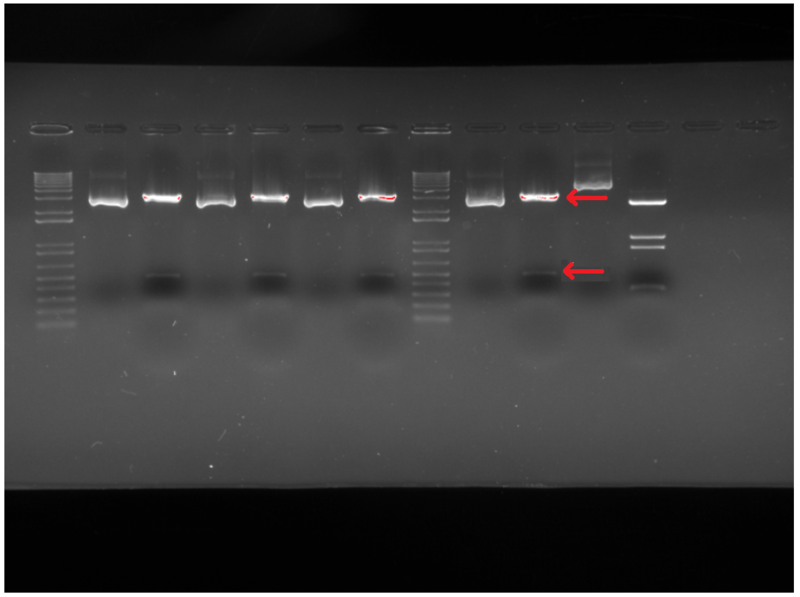 Correct insertion was again checked by colony PCR and enzymatic degradation. Our finalised plasmid was transformed into agrobacterium, which were then in turn used to transform Arabidopsis thaliana flowerheads. The resultant seeds were screened using BASTA spray, and as can be seen in Fig2. we have successfully produced transgenic plants. This process was fraught with difficulty. It is testament to utter dedication and tireless work of the lab team that even this point in the project was reached. Fig1. PCR showing the restriction digest check of our purified DONOR221+DaIRIP4 stocks. As shown by the red arrows, there are only two bands of the expected sizes for our chosen cut sites, with the far lane showing native DONOR221 treated with the same enzymes. Fig2. shows the few transgenic plants growing after BASTA screening, indicating the presence of the transgenic insert. An electrolyte leakage assay was performed to assess the protective qualities of the DaIRIP4 insertion. The percentage of electrolytes lost was used as a proxy for overall cellular damage. For this assay the five healthiest of our DaIRIP4 transgenics, and three wild type controls were tested in 1 of 3 conditions; 25oC, 0oC and -20oC. As each sample represented a separate transgenic plant, with differing insertion sites, it was expected that each plant would perform differently due to different expression and localisation of the DaIRIP4 protein in vivo. 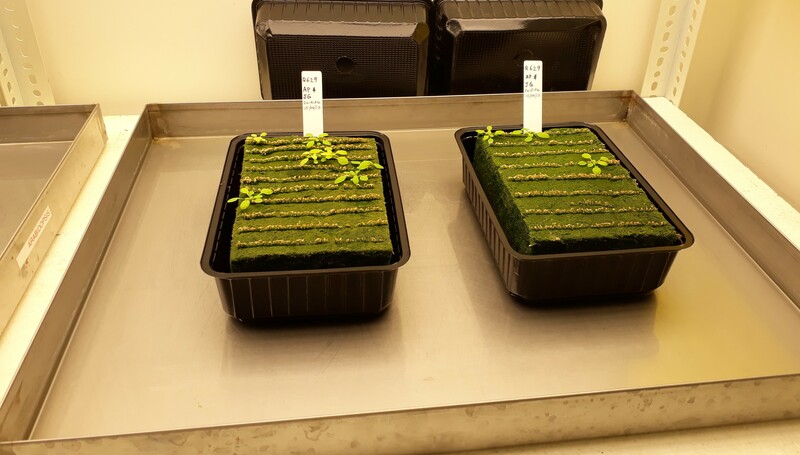 For the -20oC trials, a clear divide between our transgenic plants developed. Transgenics A and B displayed an electrolyte leakage almost half that of the control plants, while plants C to E experienced losses similar to that of the controls. From these results, it can be speculated that plants A and B have a more optimal level of DaIRIP4 expression compared to C-E, and so these will be the strains which we continue to characterise. The plants in questions have had their flowers staked and bagged ready for seeding, and we look forward to the harvesting of our first fully transgenic crop and starting a DaIRIP4 line. Fig3. The percent electrolyte loss from the DaIRIP4 transgenic plants vs control at 25oC. DaIRIP4 protein offers clear protection to this condition compared to the wild type Arabidopsis. Fig4. The percent electrolyte loss from the DaIRIP4 transgenic plants vs control at 0oC. The transgenic plants experienced similar electrolyte losses to 25oC, while the controls plants suffered smaller losses. DaIRIP4 plants still out performed wild type. Fig5. The percent electrolyte loss from the DaIRIP4 transgenic plants vs control at -20oC. Transgenics A and B showing greatly decreased damage compared to controls. Of interest was that the the control plants experienced the greatest electrolyte loss (used as a proxy for cellular damage) when immersed in the room temperature water. Our transgenic plants did not experience this loss, showing DaIRIP4 offers some protection from warm temperature damage or membrane permeability changes. We were able to make a transgenic plant that worked as intended. Find out where we want to go next here.